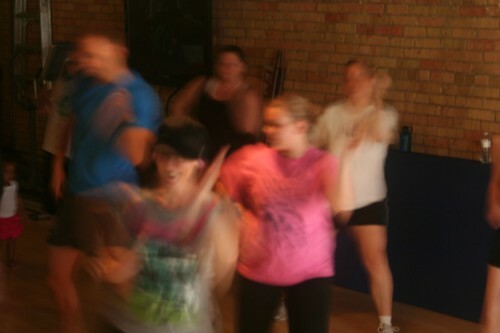 Katie, Zumba, Green Body: shakin' it! It’s not all a blur, but sometimes, that’s what really happened. Motion! My recent summer weeks have settled into a rhythm that allows me to ride my bike to and from work, on Mondays and Tuesdays. I rely on at least one of those commutes for an interval workout, as training for my upcoming Ragnar Relay race in August. The rest, I get to enjoy as time to to just ride. Sometimes, I take the shortest route possible. The pleasures of a short bike commute are plentiful! The view is 360˚ on every plane – I get a better look at things beyond the car dashboard, such as flowers, public art, or rowing skull action on the river. Few of the sounds are muffled as they are when riding in a car, which is nice when I can hear birds and river sounds, not so nice if a car’s brakes screech. My whole body feels the temperature, humidity, and sun. I don’t add to the exhaust in the air or subtract cash from my wallet to pay for gasoline. I get to play, which makes me smile. My favorite aspect, however, is that the ride home allows me to experience time differently than both the 6-minute car ride or the 40-minute walk to work. It’s between the two, with regards to the amount of time that passes, but it has to be measured on another scale completely, with regards to the experience. Riding the bike is transcendental: it’s not just a transportation mode, but an experience mode. The protected, almost sterile encapsulation feeling of riding in a car is removed: I’m bare to the elements, to the eyes of strangers, to the grease from my chain. The bike requires me to reduce the volume of things I carry, to what can fit on me and the bike. Things come just as quickly to a blur as they do to a total stop; the coffee in the tumbler in my bike bottle cage sloshes a little on my ankle, and I feel and hear the train track rails as I cross Shepard road and aim for the public art fountain. My eyes can make out the salt grains or coal chunks on the barges, but they miss the detail on the osprey across the river. I’m an adventurer, when I bike commute. I’m just a commuter, when I drive. Explanation of very threadlike connection of this story to the photo: I teach yoga in a studio that also offers Zumba classes, and I took some photos at a recent one. I didn’t transcend normal time perception there, but my camera did a great job of capturing the movement and energy in Katie’s class.